SEO Campaigns for Entrepreneurs, Solopreneurs and Small Businesses nationwide. Since 2005, I have created tremendously profitable SEO campaigns for small businesses. We are based in Nashville, TN but work virtually nationwide – anywhere in the US, specializing in search engine optimization (SEO) to get search engine ranking RESULTS. I do the every day hands-on work myself, so out of necessity, I accept a very limited number of small business clients, for whom I can make a significant impact on their business. ARE YOU A GOOD FIT FOR AN SEO CAMPAIGN? 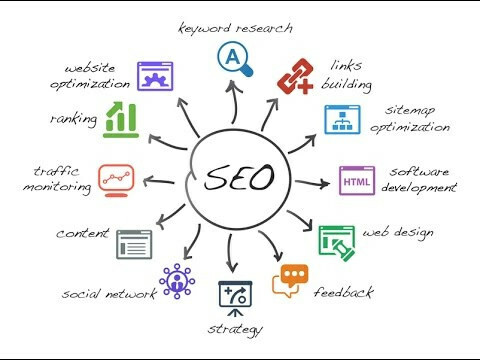 A good fit for such a focused SEO campaign is a professional who desires to gain new clients and increased revenues through improved search engine visibility, converting to more website traffic. Organic search engine optimization (SEO) helps your website attract your target customer and tell your story to your target market. It’s a must-have for modern marketers. Our focus is not only on improving your business’s website traffic and Google ranking positions, but especially on increasing your revenue. What good is increased traffic if it does not lead to increased sales? 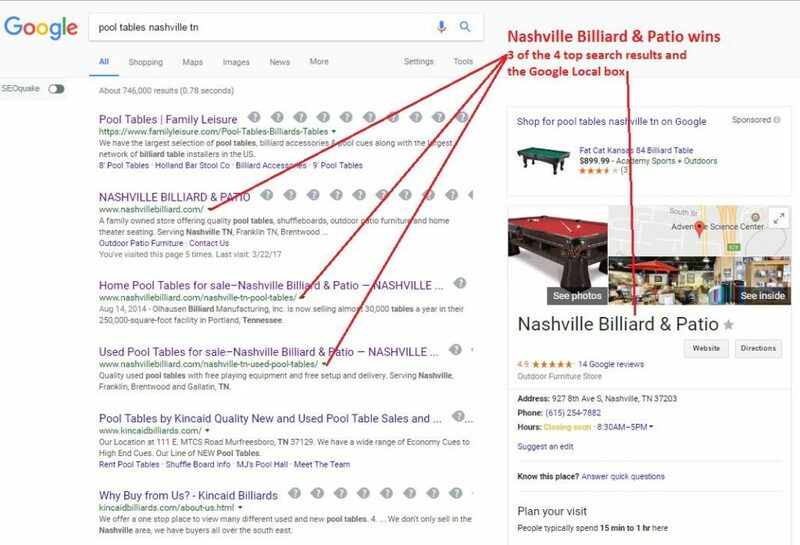 Nashville Billiard & Patio has now occupies top spots on Google’s Search Engine Return Page (SERP) for the keyword “Pool Tables Nashville TN”. We’ve worked to achieve top rank for a long list of their best ‘money’ keywords, including “Shuffleboard Tables Nashville TN”, “Shuffleboards Nashville TN”, “Home Theater Seating Nashville TN”, “Kitchen & Bar Stools Nashville TN”, and many more. You can search these other keywords on Google and see how they perform: http://www.google.com. The owners of Nashville Billiard report that many of their customers first find them through internet search. While working the monthly SEO plan, we started to see some results after only a few months. This level of competitive ranking for multiple #1-3 positions on top local keywords took us about 18 months to solidify. Every business is different. By design, I work with only a handful of small business clients, on a predetermined schedule – with ranking goals for their specific target keywords, and for winning top spots in the SERPs. When a client achieves their ranking goals, we shift from monthly SEO activity to quarterly SEO checkups. The monthly spot they left open becomes an opportunity for a new small business client. And, of course, that’s an opportunity for you. Before I let the word out that I have a new spot open, I touch base with those on my waiting list to see if they’re ready to discuss my SEO service. I will take a look at your site to determine if I can help. If I believe that I can help you get to first page Google with your target keywords – we can discuss the details of the monthly SEO work. We have the perfect SEO solution for your business – contact us today for more information. Schedule a call with Lisa to discuss your business goals. We’ll assess your SEO success potential and chat about the who, what, when, where and how of working together.